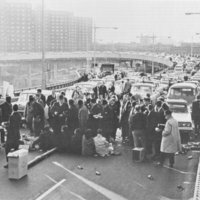 This is a March 6, 1964 photo of East River CORE's sit in demonstration at the Triborough Bridge on 125th street in Harlem. The chapter was protesting against the conditions of East Harlem's public schools. The seventh member was a woman but was not arrested. This tactic was later used by other activists including Rev. Al Sharpton in his 2008 demonstrations protesting the Sean Bell killing by NYPD. Meyer Liebowitz, “photo of East River CORE sit in on Triborough Bridge,” corenyc.org, accessed April 21, 2019, http://www.corenyc.org/omeka/items/show/181.